From the wiki: “Sanbō-in was established in the Azuchi-Momoyama period (1582–1615). It was a sub-temple of Daigo-ji, which is a Heian period temple founded in 902. The temple complex had fallen into disrepair during the Sengoku period. “A majority of the present buildings and the garden of Sanbō-in date from the late 16th century. The garden is designed as a stroll garden with a large pond and several paths and bridges. The garden is said to contain over 700 stones; and one of them, called the Fujito stone, is said to have cost over 5,000 bushels of rice. Daigo Sambo-in, Kyoto, c. 1910. Sambo-in was the site of the preeminent daimyō Hideyoshi’s famous cherry blossom-viewing party in 1598, and its elaborate pond and garden are believed to have been designed by Hideyoshi personally. “*Daigo-ji, or the Sambo-in (lit., ‘The three precious things’, the Buddhist triad: Buddhism, Buddhist rites, and the priest hood), a monastery (of the Shingon sect) about 4 M. S.E. of Inari (E, PI. C, 3), may be reached by train from the Kyoto to the Yamanashi Station, thence 1 M. on foot to Daigo-ji village (whence the temple takes its name); or by following the woods-road (good walking, in about 1} hrs.) leading behind the Miyako Hotel. One forenoon is ample for the trip, which in the spring or fall is one of the most delightful in the environs of the old capital. On alighting at Yamashina Station follow (right) the broad highway across the lowlands to the village, which is traversed its entire length. High bamboo groves flank the excellent pike beyond to the lovely hill-encircled valley in which the temple stands. 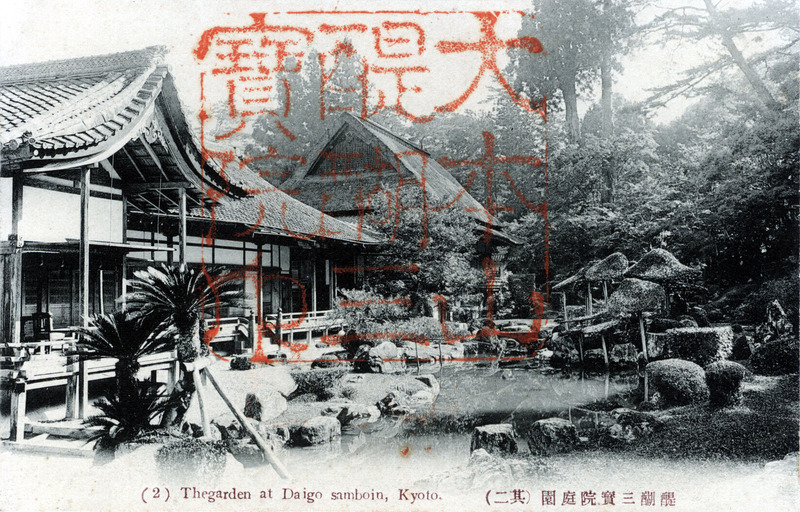 “… Daigo-ji was founded in 902 by the bonze Shobo (Rigen- Daishi). The original structures, having been partly destroyed during the Onin war, were rebuilt by Toyotomi Hideyoshi in the 16th cent., from which period the inner garden dates. Some of the roughly hewn beams of the primitive building were preserved and used in the present one, and because of these and of certain ancient structural features (the low-railed bal cony around the main edifice, the style of the priests’ apart ments, and so on) it is regarded as the best specimen extant of the fine old Buddhist fanes of early times.